Located inside the Large Magellanic Cloud (LMC) – one of our closest galaxies – in what some describe as a frightening sight, the Tarantula nebula is worth looking at in detail. Also known as 30 Doradus or NGC 2070, the nebula owes its name to the arrangement of its bright patches that somewhat resemble the legs of a tarantula. 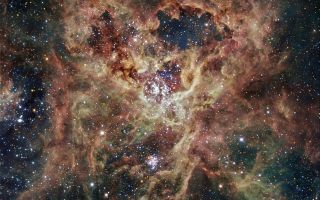 In this space wallpaper, located inside the Large Magellanic Cloud, the Tarantula nebula is worth looking at in detail. Also known as 30 Doradus or NGC 2070, the nebula owes its name to the arrangement of its bright patches that somewhat resemble the legs of a tarantula. Taking the name of one of the biggest spiders on Earth is very fitting in view of the gigantic proportions of this celestial nebula — it measures nearly 1,000 light years across! Its proximity, the favourable inclination of the LMC, and the absence of intervening dust make this nebula one of the best laboratories to better understand the formation of massive stars. This spectacular nebula is energised by an exceptionally high concentration of massive stars, often referred to as super star clusters. This image is based on data acquired with the 1.5 m Danish telescope at the ESO La Silla Observatory in Chile, through three filters (B: 80 s, V: 60 s, R: 50 s).